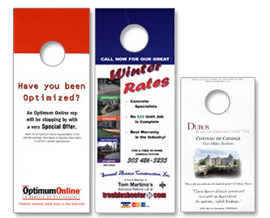 Door Hangers are a direct and effective way to advertise your products and services. Our door hanger printing services are second to none. Door Hangers are available on multiple gloss or uncoated card stocks and we also laminate for all weather door hanger prints. Standard size die cutting allows for quick turnaround of your all door hangers. If you would like to see printed samples, let us know. 1. Select options for your door hangers. 2. Add door hangers to your list.